All countries have occasional outbreaks of dangerous illnesses or diseases. In order to keep visitors from getting sick, sometimes it is recommended that they get shots or take medication before and/or during their trip. Additionally, to keep people from spreading diseases to people in other places, some countries make you prove that you have been immunized against certain diseases if you have been to a place where there has been a recent outbreak. 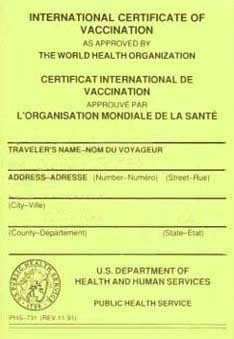 The best way to prove this is by carrying an International Certificate of Vaccination Card which is a record of all your vaccinations. Each time we go to get a vaccination, it will be recorded on our cards by the person who gives us the vaccination. What illnesses or diseases may be found in the Amazon River Basin which could be dangerous to people traveling from the United States? What immunizations should we get before going to the Amazon? Are there pills that we can take instead of getting shots? What other things can we do to help keep healthy on our trip? The Center for Disease Control (CDC) has information on infectious diseases found all over the world and can help us determine what precautions we need to take. We also visited mosquitoes.com. They have information about what diseases mosquitoes carry as we are certain to encounter a lot of those annoying critters. After you visit the CDC and mosquitoes.com let us know what you think we should do on our Guest Book.